First, the translation. This is a Victorian translation. I found it, by and large, fluid, but I suspect many will not. I do question some of his choices, and some things do not work in current English. One problem that is not John Parker’s fault is the fact that I kept on wanting to know what the Greek of the terminology was. When Dionysius talks about what Parker translates as nature in relation to Christ, is it actually physis? Given that the Areopagite is popular both sides of the Chalcedonian divide, this is a question of moment. Second, Parker’s introduction. He does a good job of … introducing the pseudonymous author. And then he gives the circumstantial arguments for the authenticity of the Dionysian corpus. I would like to say that it should not detract from the potency and truth of a document such as this if it turns out to be a forgery (which I think it is). But I am not writing in 1894. Third, the actual text. Ps-Dionysius has written two treatises translated here, ‘The Celestial Hierarchy’ and ‘The Ecclesiastical Hierarchy’. They go together. The second, in particular, makes no sense without the first, and you really do need the definition of hierarchy the first treatises provides. Moreover, the first treatise is of less moment for the Christian community without the second. ‘The Celestial Hierarchy’ divides the celestial beings into three orders and explains their functions. Here we see a deft affirmation of the transcendent God, totally Other from His creation, alongside the Neo-Platonic idea of divinity being communicated through what Plotinus would call ’emanations.’ Each order of angelic beings helps the order below it fulfil its destiny and function in the hierarchy, a main part of which is coming to as full a knowledge of God as each nature was designed to have. While those at the top have the fullest knowledge, those at the bottom are able to comprehend and contemplate as much of the divine majesty as they can due to the ministrations of the intervening orders. It is a harmonious whole, working together. This translates into the second treatise. ‘The Ecclesiastical Hierarchy’ is a meditation on the liturgical rites of the Byzantine church in relation to those who perform them. Once again, from the bishop to the excommunicated, the grace of God is communicated through the sacraments, the Scriptures, the preaching, and the communal worship. Each order, clerical, lay, and monastic, has its own special role and place in the apprehension and contemplation of God, and all depend upon each other to fulfil their role. It is easy to say of the first treatise, ‘Sure, sounds good to me,’ but the idea that, by virtue of his consecration, my bishop is closer to God than I am — that idea is hard to stomach, especially when you consider how many evil men and women, heretics and heterodox, have had hands laid on them. Yet somehow, we lay people are to find peace in resting in our place within the hierarchy. I do wonder what this looks like in practical terms beyond attentively listening to preaching and receiving the sacraments at the hands of the clerics at our churches. Finally, the whole corpus of Ps-Dionysius is highly influential in both the eastern church and the western church. It is probably worth getting to know, although I think less worth your time than, say, Anselm of Canterbury. My current direction of research is focussed upon Latin canon law, turning between its origins in the fifth century and its manuscripts around 1100 in Durham. One of the trains of thought I find myself moving down every once in a while is the integration of canon law with wider knowledge, specifically as an element of theology. S. So what is the evil that makes them bad and the good that makes them good? T. We should hold that justice is the good whereby they are good or just, both angels and men, and that whereby the will itself is called his and just; and injustice is the evil that is only a privation is the good, and makes angels and men bad and makes their will bad. So we should say that injustice is nothing but the privation of justice. As long as the will originally given to a rational nature is simultaneously oriented to its rectitude by the same act with which God gives it, thus not only inclined to rectitude, but created right, that is, oriented to what it ought to do, as long as, I say, the will remains in that rectitude that we call truth or justice, it was just. But when it distanced itself from what it ought and turned itself against it, it did not remain in the original rectitude in which it was created. And when it abandoned it, it list something great, and acquired in exchange only the privation of justice we call injustice and that has no positive being. –On the Fall of the Devil, ch. 9 (trans. in Anselm of Canterbury: The Major Works, ed. B. Davies and G. Evans, p. 206). The word justice here is, of course, iustitia. In other contexts, we would translate iustitia as righteousness and iustus as righteous rather than just. We see here also rectitude, which is a matter of order. In Law and Theology in the Middle Ages, G. R. Evans discusses the fact that rectitudo is about the right ordering of human relationships in light of the wider cosmos. Canon law is the law of the church, and it is about the ordering of our human relationships rightly in line with divine principles as derived from Scripture and tradition (the Fathers, the councils, the popes). At a theoretical level, then, the canons of the church are not mere ‘dead’ regulations as perhaps people view them today. Rather, they are seen as manifestations of how we can live in accordance with divine rectitude. In the Anselmian passage above, the more we live in line with rectitude, the more we live according to justice/righteousness, and the more we are just/righteous. In a way, this is the whole of practical theology, isn’t it? The whole of ethics? If we live justly, then we become just. Righteousness. The ius, the law, helps us do so. But we have not remained in our ‘original rectitude’, and so we often fall into unjust living contrary to rectitude and justice and are thus bad. How we get out of this so that we can live according to justice is the subject of Cur Deus Homo. My final thoughts are that this is a reminder of the integrated mindset of the patristic and medieval thinker. We are just because we live justly. While they would probably agree with the phrase simul iustus et peccator, they would be confused by the absolute division between us becoming just by grace and us demonstrating that we are just by our actions, a division often asserted by Protestants. A post I recently wrote and then deleted (‘My own powerlessness’) touched on a few subjects, and although it was unwise and indelicate of me to discuss the initial issue in it, not least because I had misunderstood what was going on, some of the other issues that surround that post are worth talking about again, and at least letting my own views be heard properly. First, I am in many ways a deep traditionalist. My love for the Book of Common Prayer, for example, is fuelled not only because I think its orders for worship helpful and its theology true but because they are beautiful and stand firmly within a wider western — and, to a degree, eastern — liturgical tradition. When I pray or sing those words, I am joining a centuries-old body of people who have also done so, and an even older and broader body who have done so in various other languages. This love of the old (I am a Classicist, after all) and of the old-fashioned or even archaic, if you will, tends sometimes towards phraseologies that, because of how language is used today, can have the appearance of exclusion and, indeed, can make women feel excluded. And making half (or more) of the human race feel excluded is, in fact, a problem. As a writer, I try to avoid ‘sexist’ language. This is not always successful, because English lacks a gender-neutral singular pronoun. As a grammar fiend, I would shudder to use ‘they’ in the singular. This is what Anne Fadiman discusses in her brilliant essay, ‘The His’er Problem’ in the fantastic book Ex-Libris: Confessions of a Common Reader. Some of you may have noticed me use the verbal mash-up ‘his’er’. As well, sometimes I get caught up in words and phraseologies that strike me and move me. Since I read a lot of old books, the older, etymological use of man(n) (and thus mankind) to mean ‘any human being’ vs. its contemporary use ‘a male human being’ (formerly wer in Old English) sometimes slips into my writing — specifically my blogging, and at times my speech, but not what little academic writing I do. I am also a bit of a translator and a reader of texts that are often translated. And here I think trying to find gender-inclusive terms for foreign gender-inclusive terms is a worthy endeavour, not only because of the normal issues attendant to gender-inclusive language but also because it can be a more precise way of speaking. Does the writer say ‘men’ or ‘human beings/people’ — uiri or homines? Sometimes there is certainly a chance that an ancient writer was only thinking of male men when writing homo or anthropos, but my job as translator is to present an English rendering of the words at hand, not necessarily their intention. Hopefully the reader can decide for his’erself. However, I am not fond of changing the words of hymns for any reason (see here and here). And this is the contingent point of my last post, not the question of gender-inclusive language. A hymn is a poem is a piece of art from its own time and place, often a time and place more sexist than ours, but also often one where the older meanings of ‘man(n)’ are more clear. I am wary of changing things because they do not match zeitgeist — the desire to change for this reason is often followed by other changes, some aesthetic (getting rid of ‘thee’ and ‘thou’), some theological (getting rid of lines such as ‘Thou our Father, Christ our brother’). I also think a jarring encounter with the past can be helpful in curing us of modern chauvinism. Finally, many times the metre and rhyme-scheme depend on a less-inclusive turn of phrase. The attempts to change are often awkward. I also think we should not condemn older generations for their use of ostensibly sexist language. Oftentimes, they were being sexist. But maybe they weren’t. We cannot always tell. So it is not worth getting worked up over, especially if in most other ways, what a particular author writes is commendable rather than condemnable. Contemporary writers, even if they don’t fully grasp the significance of the issues, should use gender-inclusive language for generic human beings. This is just good sense. It removes a barrier from the reader’s mind, and helps women and men who are more sensitive than I am to be able to engage more fully with the text in front of them. My final note on where I stand with gender-inclusivity is that I am still a traditionalist when it comes to the Godhead and specific human beings. Using the word manhood in reference to Our Lord and Saviour Jesus Christ is no problem — he was a man. Thus, in telling a story, say ‘salesman’ or ‘saleswoman’, not ‘salesperson’ (the term used if you are advertising a job vacancy). Using terms endorsed by Scripture of the Trinity is no problem — Father and Son. I am not in favour of removing these terms for vaguer terms that refer to the economy of the Trinity, because that could slide into modalism and ignores the relationships of the Persons involved. And I am not in favour of using mother-language of the Father, although mothering images as used by Scripture and writers such as John of the Cross (who refers to us suckling at God’s breast) I get. They are probably best used when they can be explained, because if simply slipped into a hymn or the liturgy, they will cause more frustration and anxiety, whereas at least in a book or sermon there is a chance to helpfully challenge our paradigms of how we envision the Divine Person(s). Throughout history, many monarchs of one sort or another have gained the appellation ‘the Great’ — Alexander the Great, Charlemagne (who assumed ‘the Great’ into his name! ), Peter the Great, Catherine the Great, and, in some circles, Constantine the Great (the only other monarch to have been saint of the week). What makes Alfred, King of Wessex (lived 849-899, reigned 871-899) great? Well, he drove a Viking army into the Danelaw and got their ruler to convert to Christianity and settle down. He also kept the Vikings out of England. He united the various English kingdoms under his rule. He established a system of burhs, fortified towns throughout his kingdom where all ablebodied men learned archery for the defence of England from Vikings. He started the famous Anglo-Saxon Chronicle. All of these things and more make Alfred a great king. And, certainly, striving to be good at your earthly calling is part of being a Christian, whether monarch or missionary, clerk or cleric, artist or apostle. 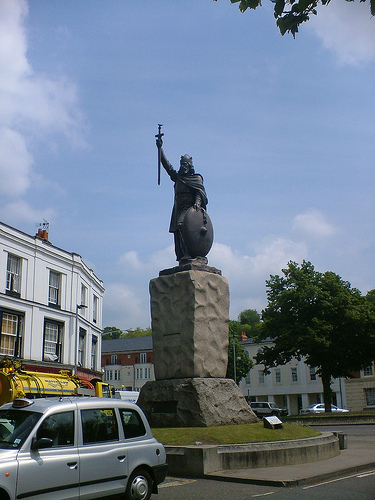 But, fascinating as these parts of the Life of King Alfred are, they are not what made King Alfred, who is commemorated tomorrow, this week’s saint. As famously related by Asser, King Alfred when a young boy did not know how to read or write, but spent his hours listening to the songs and tales of the Anglo-Saxon tongue in the court at Winchester. When he was twelve (I believe), his mother made a contest between him and his brothers, that whoever could memorise a book of poems could keep it. Alfred did so. Although he undoubtedly learned the Anglo-Saxon tongue shortly thereafter, he did not come to his knowledge of the Latin language until 30 years of age. 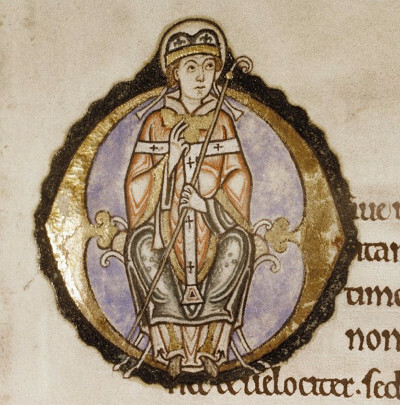 As king, he felt that it was a shame how learning had decreased in his kingdom — Anglo-Saxons had once been at the forefront of learning in Europe, in the age of Bede (saint of the week here). Probably a bit awestruck by all he had seen on the Carolingian mainland as a child and in the eternal city of Rome as well, he wanted to see learning flourish in England again. Therefore, Alfred set about ensuring that the clergy of his kingdom were all literate. He also set about translating and ensuring translatin by others from Latin those works he felt most important, including his own introductions. Most famously, he translated Boethius’ Consolation of Philosophy and Pope Gregory the Great’s Pastoral Care. This latter may have been provoked by his esteem of the Roman see because of his visits there as well as Gregory’s having sent Augustine (saint of the week here) as a missionary to Canterbury. However, we should also note that the Pastoral Care is also one of the only works from the Latin Fathers to have been widely translated and disseminated throughout the Greek world. That is to say, it was world classic of Christian thought as well as being of practical value for Alfred’s clergy. Now, to say that Alfred’s organisation of learning and translation throughout his kingdom was a particularly Christian thing to do is not to say that no pagan monarch ever did such a thing (see the Ptolemies at Alexandria), but I still think it a more noticeably Christian action than the defence from attack. Christianity has always been a religion of the book, and so learning has always been held in high esteem by all Christians — at least basic literacy, even amongst some anti-intellectual Franciscans. In later centuries, it would be Christians like John Knox who would promote universal education on this island. I believe that King Alfred, although his emphasis was on clergy and nobility, stands within that same Christian tradition of education. 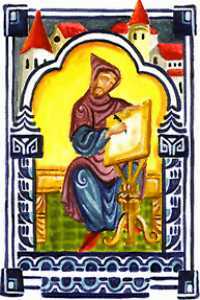 Furthermore, the Christianness of his translations is further proof of how Alfred is engaged in the task of educating as a Christian king — we have Boethius and Gregory, not Virgil and Horace here, after all. Alfred the Great, ed. and trans. Simon Keynes. This Penguin Classic includes Asser’s Life as well as relevant selections from the Anglo-Saxon Chronicle and various documents illustrating the reign of King Alfred, including some of his own writings. The Anglo-Saxon World: An Anthology, ed. Kevin Crossley-Holland. This anthology includes not only the complete Beowulf in Crossley-Holland’s translation but a variety of Anglo-Saxon and Latin documents from the Anglo-Saxon world, both Christian and secular, poetry and prose. Anglo-Saxon Christianity by Paul Cavill discusses Christianity in Britain in the days of the Anglo-Saxons, showing the union of Mediterranean religious values and ‘Germanic’ cultural traditions that occurred here in those days long ago. BBC History website about the Anglo-Saxons, 410-800. This site includes discussions of Christianity. BBC History website about Alfred the Great. Dionysius Exiguus, or ‘Denys the Short’ (Wee Dennis, perhaps?) was a ‘Scythian’ (ie. from the Northeastern edge of the Roman Empire) monk who lived at Rome in the early sixth century. I have a feeling this is precisely why he has fallen into obscurity, for — other than Boethius & Benedict — the Latin Fathers between the two papal Greats (Leo, d. 461, & Gregory, ascended sedes Apostolica 590) are often overlooked. One may read Sidonius Apollonaris out of an interest in Late Latin prose style, but who reads Cassiodorus these days? Anyway, this wee man is far too often overlooked. The only two books I found about him in the University of Edinburgh Library are both about the fact that he is the person who set out to establish the date of Christ’s birth — and his version stuck, even though he got it wrong (thus BC & AD trace back to him). 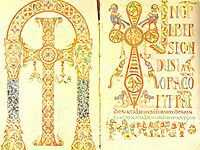 These two works are both fairly recent, Anno Domini by Georges Declercq and The Easter computus and the origins of the Christian era by Alden A. Mosshammer. Dionysius, though, is an important person to focus our attention upon not only because of Anno Domini starting with him, but also because of the important place he stands and the era of which he is indicative. Dionysius was prominent chiefly for two activities — translating and editing (maybe this is why I think we should look at him more closely!). He translated various works into Latin, such as the Life of St. Pachomius, Proterius of Alexandria’s letter to Pope Leo, the letter of Proclus of Constantinople to the Armenians concerning the orthodox faith, and some works of Gregory of Nyssa concerning the creation of the world. Sadly, as the Oxford Classical Dictionary notes, ‘Translation has often been marginalized as a second-order activity, lacking in originality’ (‘Translation’). People have an obsession with first things, with the primus inventor, with ‘the original’, with ‘creativity’ and ‘new contributions to knowledge’ that things such as translation or Roman art or the entirety of the Middle Ages, due to their ‘derivative’ nature are scorned and ignored. Yet translation is an important task. It can tell you as much about the translator as a text composed by the author him/herself. Is this writer skilled at the primary language? Is there facility in the rendering into the target language? What things are changed? What effects do these changes have? Why might they have been made? Are all changes ‘errors’? Can a translation ‘improve’ upon the original? Furthermore, the Early Medieval enterprise of translation is an important reality in a world where Latin and Greek readers are becoming more and more estranged, unable to read each other’s bodies of literature. Therefore, it becomes imperative that important texts be made available in Latin for the Latin-reading public. Part of the shift from a ‘Classical’ to a ‘Medieval’ world was the shift from a bilingual Roman Empire to a very real, at times insurmountable, division between the Greek East and the Latin West. Observing which works were translated by Dionysius and his contemporaries. and for whom and what the distribution of these translations was can show us a lot about the late Patristic Age as it forged a brave, new Medieval world. Dionysius Exiguus is also notable for his contribution to canon law. Here, again, he is not the first to engage in the task under discussion, but he is important and indicative of the age in his own right. He compiled a bipartite collection of documents related to canon law (a ‘canonical collection’), the first part covering the canons of various synods East and West up to Chalcedon, the second collecting papal letters from 284-498. This, the Collectio Dionysiana, is not unique. Of the canonical collections that contain letters of Leo the Great, fifteen of them are from the sixth century; of the fifteen, seven are from the first half, including the Dionysiana. Although I am aware only of canonical collections with Leonine material, no such collections seem to exist prior to the turn of the sixth century. The early 500s, then, are an important age for the transmission of canon law. Collections such as the Collectio Dionysiana are very important in this period, because the papal Register was an invention of Gregory the Great. Thus, pre-Gregorian papal letters have a somewhat patchy and scattered history (quite literally). Taking these disparate materials and putting a number of them into a single volume for easy access was a vitally important task at the the beginning of the 500s. Thus could popes and other persons with a need to consult the mind of past Bishops of Rome on issues of faith and practice have an easier time of it. Furthermore, the choice of letters, whether through necessity (‘These are all I have’) or editorial practice (‘These are all I shall use’) helps shape future opinion on these subjects. No longer will popes have to simply cite Sancti Patres; they can actually name who said what — Noster Pater Sanctus Leo, Papa Romae. This collection, in particular, has an important place in the development of canon law. Other canonical collections made use of the Dionysiana, such as Collectio Vaticana (6th century), Cresconius’ Concordia canonum (mid-6th with a wide array of manuscripts surviving), Collectio Dionysio-Hadriana (8th, many mss), and Collectio Dionysiana adaucta (9th). Canon jurists and papal advisers and popes were reading the Collectio Dionysiana for centuries as they compiled new, larger canonical collections. This particular arrangement and gathering of papal documents would have shaped their own view of papal authority and the ordering of bishops, priests, and deacons. The manuscripts of collections that trace themselves back to Dionysius are mostly no later than the twelfth century, although there is one from the sixteenth. In the twelfth century, Gratian made his famous Decretum, that brought together various excerpts from canons and papal letters arranged systematically on certain questions, so the copying of material such as the Dionysiana would have understandably gone down. Nevertheless, that is five hundred years of consistent copying and use, even in the face of the famous and influential Pseudo-Isidorian Decretals. Finally, this anthologising of Dionysius’ is, like his translations, indicative of his age. The Later Roman Empire was a world saturated by far too much reading material, and anthologies were in vogue. I doubt this was because people didn’t like reading long extracts or entire works; rather, it’s because there was so much available to put into the anthologies. It is an age where a person can gain a lot without having to read all 144 books of Livy, or over 100 papal letters just to answer one question. Dionysius is part of the culture that gives birth to the Middle Ages. He is indicative of the wider realm in many ways, and important for the development of western European culture in the years following the ‘Fall’ of Rome. For these reasons, he is too much overlooked. In the 1920’s, there was a papal call to ‘return to the sources’ which produced a number of Catholic theologians who worked on the ancient and mediaeval theologians, seeking to bring their wisdom to today and seeking to make their words available today, both through scholar editions such as Sources Chrétiennes and translations such as Sources Chrétiennes. This movement was and is the Ressourcement, and produced major works such as Henri de Lubac’s Exégèse Mediévale. In the English-speaking world, today’s Christian who is seeking to discover the Fathers has many thanks to render unto the Catholics and their publishing houses. Paulist Press, the publishing house of the Missionary Society of Saint Paul the Apostle, has produced two great series of English translations and editions, the Ancient Christian Writers and The Classics of Western Spirituality. The former is a series of highly scholarly translations of a vast range of ancient Greek and Latin Christian texts. A full list is available here. Augustine of Hippo: Selected Writings, The of Antony and the Letter to Marcellinus by Athanasius, Apocalyptic Spirituality includes selections from Lactantius but is mostly mediaeval, The Life of Moses by Gregory of Nyssa, The Conferences by John Cassian, The Ladder of Divine Ascent by John Climacus, Maximus the Confessor: Selected Writings, Origen: Selected Writings, Pseudo-Dionysius: The Complete Works, The Fifty Spiritual Homilies and the Great Letter by Pseudo-Macarius, Hymns by Ephrem the Syrian, and On the Song of Songs and Selected Writings by the Venerable Bede. While this series covers the Western Church very well for the Middle Ages, it is too bad they are missing much of Western Patristic spirituality. The Fathers of the Church is a long-running, high-quality series of English translations of the Fathers. A list of works translated is available here. This series is very large. The Library of Early Christianity is a new venture started by CUA, and I’m excited about it. It seeks to present Loeb-style editions of early Christian texts in Latin, Greek, and Syriac (I’m not sure if other languages such as Coptic will be included) with facing-page English translations. This series will be a blessing to many as it gets up and running, I am sure! Apart from these series of translations, Catholic scholars have been involved in translation projects with Routledge’s Early Church Father’s series, SVS Press’s Popular Patristics Series, Penguin Classics, Oxford World’s Classics, and so forth. To go into the Ressourcement work beyond translation would be too much for now, but Eerdmans’ Ressourcement: Retrieval and Renewal in Catholic Thought series is worth looking into here. The series includes the English translation of Lubac’s Medieval Exegesis. For later: The Evangelical Ressourcement?